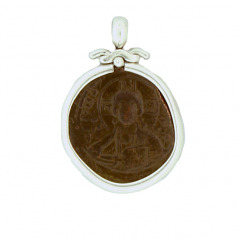 Ancient Byzantine bronze Christ coin pendant framed in sterling silver. DENOMINATION: Anonymous Folles, Bronze. DATE: 696-1092 AD. OBVERSE: Portrait of Jesus Christ. 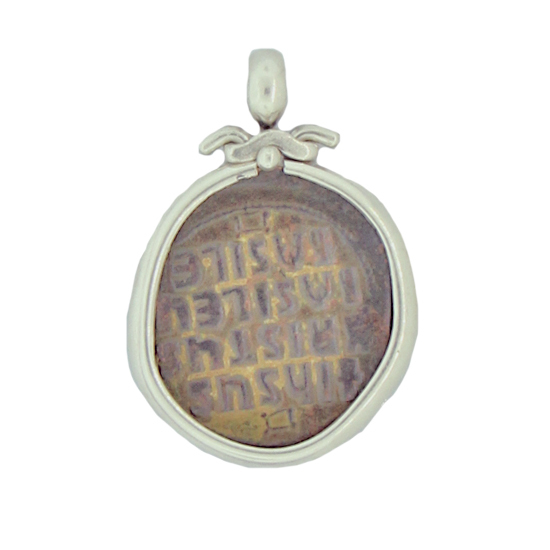 REVERSE: Inscription in Latin " Jesus Christ, King of Kings"
This coin is part of a grouping of coins called "Anonymous Folles". These coins are so-called because they do not bear the name or mark of any particular ruler, but include purely religious images and inscriptions. According to numismatic data and other resources from that period, anonymous folles were first struck during the period of John I. in the time between the accession to the throne of John I in 969 and the great monetary reform of Alexius I in 1092, the copper coinage of the Byzantine Empire is distinguishable from that of earlier centuries in two respects. First, there is a portrait of christ on copper coins, although it was an application preferred only on golden coins until that time. Second, they were not struck in the name of any emperor.